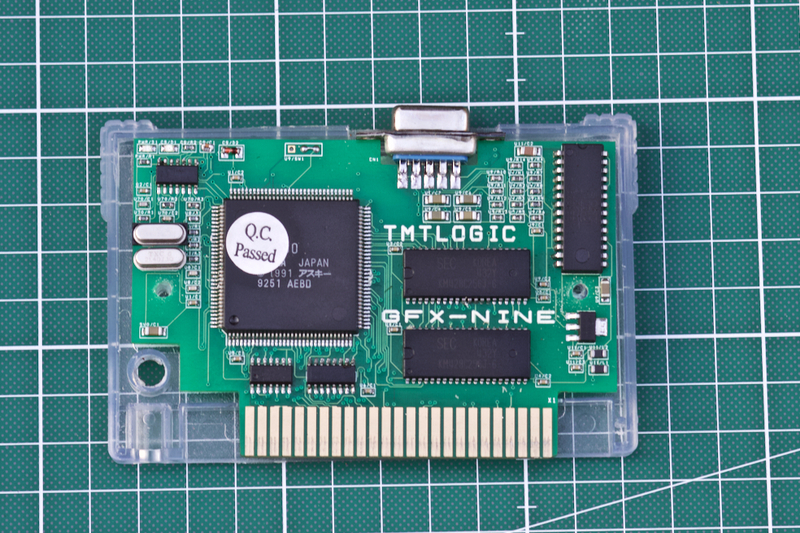 After sensational retro-computer hardware products like the DAB receiver, the UMJA USB adapter and the MP3 player cartridge SE-One, the Dutch manufacturer TMT Logic released the Graphics 9000 clone GFX-nine. The latest v9990 MSX pixel extension. While v9990 compatible hardware for MSX has been around for about 20 years already, it is still the highest level of graphical extension for this old 8-bit machine. And still, there is an active community developing software for it. Recent games like Chibi Akumas, Codename: Intruder,Life on Earth, Myths and Dragons but also applications like SymbOS all make good use of this hardware. 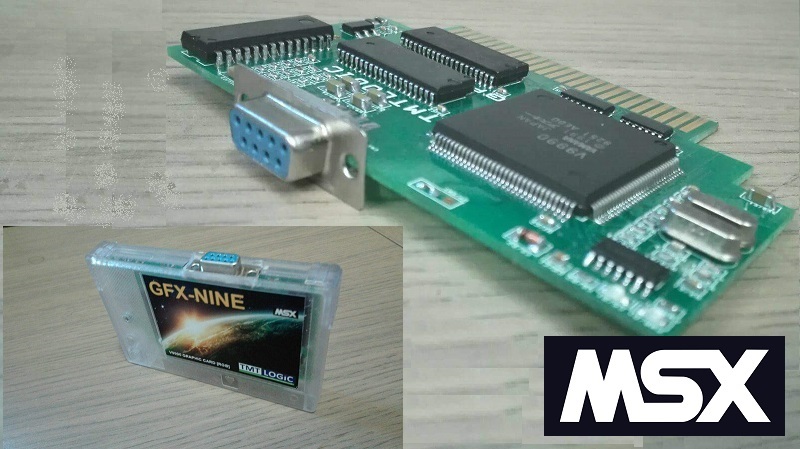 The latest MSX v9990 family member is Tmtlogic's GFX-nine. All specifications correspond to the quasi standard of Sunrise, and a db9-to-scart connector.Scart adapter cable is included. In a similar form factor as the Powergaph lite, it is much smaller than the original model of Sunrise. The hardware is delivered in a Konami-like case. Tmtlogic is a non-profit group of hobbyists developing hard- and software for older home computers, like MSX. The GFX-nine is produced in small batches, interested parties please contact TMT Logic.. The price of this little jewel is yet to be announced. The price indeed depends on a new batch, and will be announced later. Ah, sorry for that! I should have known better! This incredible piece of hardware can be put easily on a MSX cartridge, being inmmediately compatible, because Prodatron is supporting it on SymbOS. It will be released on next March. And about the GFX-NINE, it is a good option for Europeans, better look on the smallest case, only VAT tax and lower shipping. It has been suscessfully used on the AMSAP MSX adapter for CPC, also from Hans of TMTLogic(on the video above), and on the M-SLOT MSX adapter for the Enterprise computers. I was really surprised, when I heard about that amazing work and the CPC scene using the GFX. It sounds great quality. I will buy one if I did not already have a GFX-9000. S-Video adapter looks same as Tecnobytes version. Is there no better solution? @hamlet, can you take pictures for the wiki? Yes of course. Good that you update the wiki. Nice to have a Dutch manufactured V9990 cartridge again as well! i missed this during last nijmegen fair.. probably already sold out by the time i got there. Interested in one from second batch eventhough i already have a powergraph. @gdx I added some GFX-Nine pictures at this mix.pics folder. Fell free to add some to the wiki. I'm interested in one from the 2nd batch too. I don't know that much about microelectronics, but as I can see, it's almost a copy of Tecnobytes' Powergraph Light (https://msx.pics/image/Unu8F). The only difference that I can see is that the former one uses discrete components, instead of SMD (as I saw in GFX-Nine). Is there any new features like superimposing, BIOS, HDMI, YPbPr or it's only a Powergraph Light copy? BTW, will be any adaptors, in order to connect this cartridge using S-Video, RCA, etc? Is there a HD15 connector, or a DB9? Calling it a copy sounds a little bit degrading imo. Sunrise Graphics9000 was the original and we should count ourselves lucky that people are still manufacturing compatible hardware on the various continents of the world today! In such a nice small form factor, too! Though I would really like to see superimposition, too. A BIOS would not add value I think, since the others don't have it it would make software that uses it incompatible. Agree with Grauw too. The most important is that people are still manufacturing such pieces of hardware !